Social media poses three major computational challenges, dubbed by Gartner the 3Vs of big data: volume, velocity, and variety. PHEME focuses on a fourth crucial, but hitherto largely unstudies, challenge: veracity. We coined the term phemes to describe memes which are enhanced with thruthfulness information. It is a reference also to Pheme – the Greek goddess of fame and rumours. 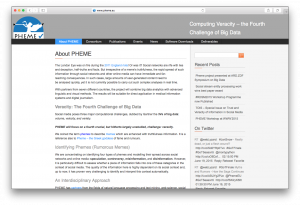 PHEME is concentrating on identifying phemes automatically and modelling their spread across social networks and online media. The quality of the results is highly dependent on the social context and, up to now, it has proven very challenging to identify and interpret this context automatically. 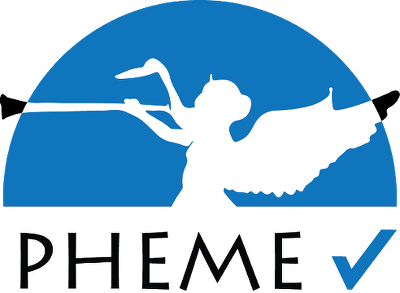 For more information please visit www.pheme.eu. This project has received funding from the European Union’s Seventh Framework Programme for research, technological development and demonstration under grant agreement no 611233.